In June 2009 missive “Iran and the Internet Democracy“, I explained how then-recent contextual cloud services used with cell phones had begun, in just three years, to dramatically empower anyone and everyone to self-broadcast/report in ways that not long earlier was the monopoly of media professionals. I have repeatedly revisited this concept since, particularly as more tools became available, mobile broadband expanded reach while becoming less costly, and consumer behavior adapted to the opportunities presented. Most recently, in April 2017: “Praise Be Citizen Journalists“. Today, the memorial service for my mom, who died August 5th, took place in Burlington, Vt. The church broadcast the farewell live online, via Ustream, which was founded in 2007. 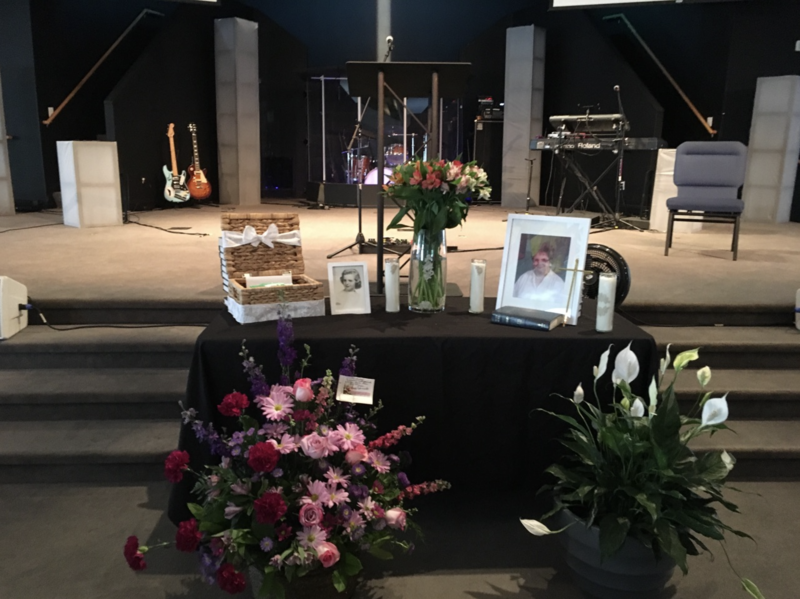 But had the family chosen to instead hold a more intimate gathering, anyone with a smartphone could have shared the send-off via a number of services, such as Facebook Live, Periscope, YouTube, or, yes, Ustream, among others. FB opened to the public in September 2006; Live, to everyone, in April 2016. Periscope: March 2015. YouTube is the grandpa service, officially opening in November 2005 but live streaming for the masses debuted only about four months ago. The power is in your pocket to broadcast to anyone, anywhere, at anytime. Just ask all those crazy Instagrammers and SnapChatters. They know. Social media played a massively important role getting out news about mom’s passing, particularly Facebook. People shared memories, reconnected with relatives, read her obituary, and got the link to stream the memorial. I remain one of FB’s largest detractors, despite some of the benefits received this week. The user interface is overly—and unnecessarily—complex, while the overall design motif takes too many cues from traditional desktop software, rather than provides a fluent and fluid contextual user experience. For example, too much of the interaction around this family tragedy spreads across too many posts—comments and replies to them—among a disparate group of people; some of whom have relationship, but many who do not. Yet what they communicate could be valuable to everyone mom touched. Meaning: Context is grossly limited, despite tools like tagging. Fast-forward to the first anniversary of her death next year: Based on experience with other persons’ passing, there will be no cohesive, concise, compact way to contextually bring together all the FB posts, photos, comments, replies, and other interactions. I fault Facebook’s foundational design ethic, and its adaption to revenue-reaping, for these limitations. The context that makes interactions most meaningful is time. That said, perhaps as the social network adopts and expands more artificial intelligence technologies, UX will contextually improve. Fingers crossed. Something else about context: so-called fake news, which the traditional media largely blames Facebook for. That’s unfair. Misinformation, like information, is everywhere—reaching across a vast universe of contextual cloud social services. Hehe, even among many mainstream news services, whether it be writer editorialization or audience comments (e.g., readers, watchers, listeners). For all Facebook’s faults, harbinger of the fake news apocalypse isn’t among them. We are awash with content, like no other time in human history. There is too much produced, whether by professionals or regular Joes and Janes across the sprawling social InterWebs. No one can consume even a fraction of what’s there. Misinformation, and so-called fake news, should surprise no one. It is my strong conviction that journalists should predominately stop news gathering and adopt broader roles as curators of truth and compilers of stories. Social media’s foible is spreading misinformation. Human beings are innate gossipers, sadly; enough people say something often enough and it’s accepted as truth—regardless how false. Citizen journalists, and their know-it-all counterparts, are empowered to report and broadcast anytime, anywhere, on anything, for any audience. News media professionals, whose credo is to serve the public interest, would benefit everyone by sifting truth from the masses of online content, through curation and responsible, unbiased editing. Now excuse me while I return to mourning mom. For now. I’m coming back to this topic—the journalist’s new role—in a future post.